By Johnny Benz, Doghouse Boxing - By now most of us will agree that illegal performance enhancing drugs (steroids) is a no-no in any sport. It's also very dangerous in a sport like boxing because of the punches being thrown and landed. No boxer should try and take advantage by using illegal drugs. So personally I can understand and even agree with Floyd "Money" Mayweather Jr. on his stance to have anyone he faces adhere to Olympic style drug testing. Recently quoted by Lance Pugmire of the Los Angeles Times, Floyd Mayweather who was training at his Las Vegas gym for his upcoming September 17th battle against Victor Ortiz, spoke out once again on drug testing and why it's important to him. 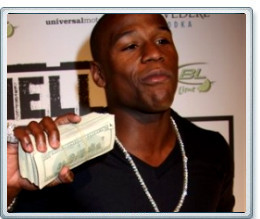 Mayweather, who goes by the nickname "Money", admits it's not all about the "Money" when it comes to negotiating a fight. With all the punch-drunk fighters in the sport, Mayweather would rather negotiate a clean fight (with no drugs in any fighter's blood stream), then cash out. "I don't care how much money is negotiated," stated Mayweather from his Vegas gym, adding: "This (performance-enhancing drug testing) is what I want. Look at how these guys end up punch-drunk in this sport." In regards to Floyd Mayweather vs. Manny Pacquiao... according to the same report in the Los Angeles Times, there are signs Floyd Mayweather and Manny Pacquiao are closer to reaching an agreement on a drug-testing protocol.